Normally, I would introduce myself as Xavi -- defender of all that is good and just -- and I would offer you a generous gift of train whistles and various cheeses, but today there is no time for such pleasantries. A savage, intestine-devouring murder has occurred and now I come to you in the hopes of punishing the demons responsible! Now, this was not the murder of an innocent human being. It was, in fact, far worse. It was the murder of football. This may sound like an exaggeration, but I assure you it is not. Football is dead forever and there is blood and urine all over Milan's hands. Literally. Under a nightmarish black sky in a wretched city that definitely is not Barcelona, my colleagues and I attempted to unite the world with a sublime display of football as it must be played, as per usual. But our noble mission -- as foretold in ancient times by an angel called Mike who rides a dolphin that coincidentally also goes by the name of Mike -- was cruelly snuffed out in front of thousands of Milan fans who secretly wanted us to win. The problem was not Milan's inferior talent or flat out wrong style -- we still outplayed them because of course we did. The problem was the leprosy-infused pitch that dragged us down as we attempted to symbolically feed all the starving children around the universe with our grace and precision passing. This was not an accident. 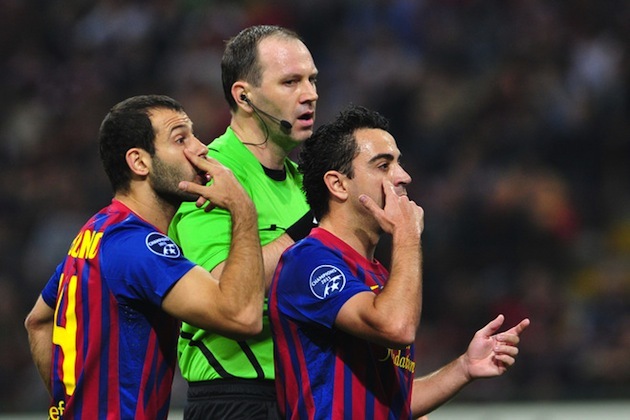 It was a premeditated decision to punish genius and cause suffering to Cesc Fabregas, prince among men. Proper football can only be played on an absolutely perfect surface, manicured with the explicit hope of pleasing Barcelona. Everyone knows this. And to defy this divine law is simply unforgivable. As a result, Barcelona (a.k.a. football) has suffered, unborn puppies of the future have suffered and, most terribly, Cesc. Has. Suffered. I expect you to make this right (and buy Cesc a gift worth absolutely no less than €15). If you don't, consequences will never be the same.